Na mednarodnem fotografskem natečaju pričakujejo fotografije svetih gajev in drugih naravnih svetih mest. Cilj fotografskega natečaja je zavedanje o pomenu naravne in kulturne dediščine in privabiti obiskovalce, da ta mesta obiščejo in obvarujejo. Na natečaj lahko pošljete fotografije ugrofinskih kot tudi vseh drugih svetih mest na svetu. Tema letošnjega enajstega fotografskega natečaja so zgodovinska naravna (ne grajena) sveta mesta: gaji in svete gore, vodna mesta, drevesa, kamni in drugi naravni objekti, kjer so naši predniki molili, se zdravili, prinašali darove, vedeževali in izvajali druge obrede. Naravna sveta mesta se dobijo pri mnogih starih narodih in so skupna dediščina človeštva. Zaradi pomanjkanja informacij in zaščite so mnoga sveta mesta tako v Estoniji, kot tudi drugod, v nevarnosti, da izginejo. 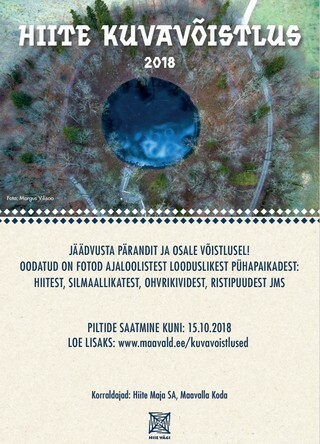 Organizatorji fotografskega natečaja “Sveti naravni gaji” so CU “Hiite Maja” in društvo stare naravne vere Estonije “Maavalla koda”. Povzetek: Vsak udeleženec lahko pošlje do 20 digitalnih fotografij. Fotografije naj bodo v formatu .jpg in naj ne bodo večje od 15 MB. Zraven naj bo pripis zgodovinskega svetega mesta. The photography contest welcomes you to submit images of sacred groves and other historical sacred natural sites. Photos can be submitted until 15 October 2018. When you have selected the photos, in accordance with the rules, that you wish to submit to the contest – you may begin. Each photo must be uploaded separately. After uploading, a message will appear confirming the success or failure of your submission. Please fill out all fields! Only the image’s title, the name of the sacred site photographed and the photographer’s name will be published. For security reasons, the organiser will make a separate decision about publishing the location or any additional information regarding the sacred site. An explanation of why this location is considered a historical sacred natural site must be added to the photo. The source of the information (word of mouth, read, other media) must also be included. As a note, the photograph becomes more valuable when it includes its story – how it was made, discovering the location, looking for the location and taking the photo. Also, be sure to include the name, address and date of birth of the person who is submitting the entry. Country, state, county, parish, village, farm etc. With this option, the photographer allows the photo to be used according to a license-free use under the conditions of Creative Commons 3.0. Images may be used free of charge for non-profit purposes, when including the photographer’s name. – Raising awareness of the diversity, value and rarity of various endangered sacred natural sites. – Guiding people to the sacred sites, to visit and document them. – Recording the locations, state of, uses of, and meanings of the sacred sites. – Collecting beautiful images to introduce others to the sacred sites. Participation is open to all except for persons related to those organising the contest. 4.1 The Grand Prize (1000 euros) – the winner will be selected from among all entries. 4.2 Youth Grand Prize (200 euros) – the winner will be selected from among the entries submitted by those up to, and including, age 16. 4.3 The Ural Peoples’ Prize (300 euros) – the winner will be selected from images recorded among the Finno-Ugric countries and territories category. 4.13 Health. (healing sites, healing activities and objects in the sacred natural sites). 4.18 The organiser has the right to set up additional regional, and other, prize categories during the contest. 5.1 A historical (traditional) sacred natural site must be captured/recorded in the photo: a sacred grove, tree, stone, hill, bank, cave, water body, cross-tree etc., or a part of it. In addition, living and non-living natural things, items, facilities, practices and other events in the sacred site, or pre-existing damages in the sacred site can be captured/recorded. 5.2 The captured/recorded place or item must be recognisable. 5.3 Cup-marked stones (cult stones with small cup-marks) can be classified as a sacred natural site only as an exception, provided that the related tradition of the sanctity of the stone in question is directly known. 5.4 A tumulus, cemetery, sauna, shrine, swing, chapel, church or other facility, also including natural objects without a related tradition, can be considered for entry into the contest if it is situated in a sacred natural site. 6.1 Each participant may submit up to 20 digital images in the contest. 6.2 Photos recorded as diapositive, or negative film versions must be presented digitalised. 6.3 Entries must be presented in jpg format. 6.4 The longest side of the image must be the minimum 3,000 pixels. 6.5 File size can be up to 15 MB. 6.6 Cropping, full or partial brightness correction, contrast and colour, and image sharpening is allowed. 6.7 It is not allowed to add or remove elements, except for the removal of dust spots. 6.8 Digital gluing of panoramas and increasing the dynamic range (HDR=high dynamic range) is allowed. 6.9 Photo processing should be based on good practice; images should be formed realistically and naturally. 6.10 Contest entries must be accompanied by a description of the photo taking process, the tradition(s) related to the site, or other data about the sanctity of the location. The description should reveal why the photographer considers it a historical sacred natural site. 7.1 The jury is comprised of recognised photographers, experts, artists and other specialists. 7.2 The jury will select the best picture from each prize category to be given an award. 7.3.1 Accurate location – is the captured image a historical sacred natural site? 7.3.2 Dimensions – are the dimensions of the image in accordance with the rules? 7.3.3 Impression – is it a remarkable photo? 7.3.4 Message – does the site, or sites, evoke feelings, questions, or thoughts? 7.3.5 Technical execution – do the sharpness, colours, contrast and other technical characteristics seem natural? 7.3.6 Document – how much information does the image provide about the state, meaning and use of the sacred site? 7.3.7 Additional value – is the image somehow pleasantly surprising? 7.4. The jury presumes that in the course of capturing the image, the natural and cultural heritage or the site was respected and good historical practices were followed. 8.1 The pictures sent to the contest, as well as the image information, the name and location of the place, the description of the image, the date and the author’s name, will be published on the page at the contest. 8.2 The organisers have the right to use the participating images free of charge, to introduce the contest in the media, publications, public events, websites etc., with reference to the author. 8.3 The awarded pictures can also be used free of charge, for other aims that promote the protection of sacred sites, with reference to the author. Other entries of the contest can be used for these aims in agreement with the authors. 8.4 The participants of the contest will have the opportunity to publish the pictures under the free license Creative Commons 3.0 that allows everyone to use pictures free of charge for non-profit purposes, provided the reference to the author of the picture is given. The organiser is responsible for the lawful use of the submitted entries, while keeping the locational data of the endangered sacred sites undisclosed. 10.1 The participant is responsible for the accuracy of the presented data about himself/herself and the photos. The participant confirms that he/she is the author of the submitted entries and agrees with the terms of the contest. 10.2 The author shall present an original file, slide or a negative for comparison, as well as information about the shoot should the organiser ask for it. Historical sacred natural sites were originally naturally occurring places of land or water areas that our ancestors used for prayer, to bring offerings, for healing and other practices related to their native religion before the 20th century. Newer cross-trees are also considered among sacred sites. Natural objects (landform, water bodies, stones, vegetation etc. ), situated in the location of the sacred natural site, and their facilities (e.g., a campfire site, dance grounds and burial grounds) are associated with the worship of the sacred site, are all part of the sacred site.